Your guide to Herbal Teas! Whether you’re looking to detoxify your body, find a soothing replacement for coffee or aid digestion… a natural herbal tea can do the trick! We find that at this time of year, there’s nothing more relaxing than sipping on a warm cup of tea. 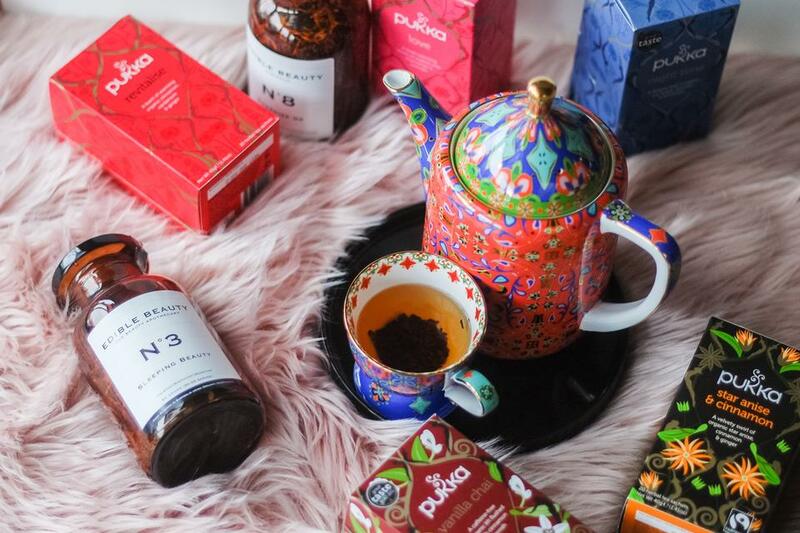 Best herbal teas for improving your well being! 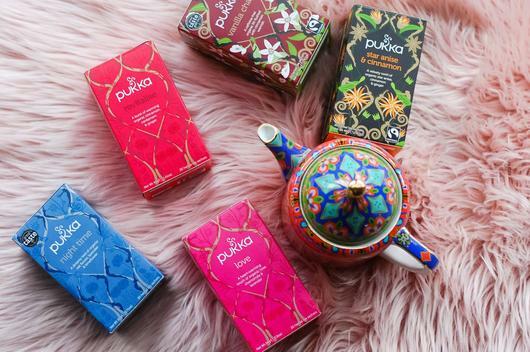 If you’re feeling like you need a boost throughout the day, the Pukka tea Revitalise £3.80, contains a warming blend of herbs that will leave you feeling invigorated and your skin glowing! It’s made with a blend of revitalising Orange Peel, Cinnamon Bark, Elderflower and Green Tea which are all ethically sourced and organic. To use, leave in boiling water for at least 5 minutes. The Pukka love tea £3.60, is one of our favourites as it promotes relaxation while also uplifting the senses. It’s made using FairWild flowers including Rose, Chamomile and Lavender to soothe your tastebuds and relieve any tension. It’s very warming and perfect for a gentle burst of energy to get you through the day. This tea is great for vegans and anyone that follows a gluten free, nut free or dairy free diet. For a herbal replacement to your morning coffee, thee Pukka Tea Star Anise & cinnamon £3.60, is a great choice. It’s a spicy and warming ingredients including Ginger and Cinnamon which aid digestion. This tea is sweet and loaded with antioxidants, so it’s just as good for your body as it tastes! The Pukka tea vanilla chai £3.60 is the ideal choice for any chai tea lover! It’s made with a blend of Cinnamon, Licorice and Vanilla for a warm and sweet treat for the afternoon. This tea is made with a blend of six organic herbs that have been sourced from independent farmers worldwide! It’s organically grown and caffeine free meaning it’s the ideal choice for nighttime as it won’t keep you awake! This naturally caffeine free tea is made with a healthy blend of Peppermint and FairWild Licorice which soothes digestive issues, nourishes the body and helps relieve tension. It’s very refreshing and has a sweet taste that is ideal for any time of the day! The Pukka tea Peppermint & Licorice £3.60, helps to calm the mind and relieve bloating. Another fantastic detoxifying tea from Pukka detox tea is the £3.60. This tea contains a powerful and delicious blend of herbs that cleanse, detoxify and soothe the body. Some of these include Aniseed, Cardamon and Fennel which work together to create an aromatic and sweet flavour. The Licorice Root is a very calming ingredient that has benefits for the entire body. Naturally caffeine free, this tea can be drunk all day long! Again using the benefits of calming Chamomile, the Pukka relax tea £3.60, will leave you feeling calm and ready for bed. Made with a blend of relaxing herbs including Fennel Seed and Marshmallow Root, this tea is naturally caffeine free and helps you to unwind after a long day. We love sipping on this tea in the evening because it’s so soothing! Another amazing tea to promote relaxation is Pukka nigh time £3.60. This smooth blend of herbs helps you to unwind, relax and drift off into a restful sleep. It’s the ideal way to ensure that you wake up in the morning feeling fresh and energised for the day ahead. Containing nourishing Oat Flower and calming Lavender, this tea is 100% organic and ethically sourced!